Christmas has reached our house! Of course, Christmas is more than trees, and presents, and pretty lights, but those pretty lights sure make me happy when things are sparkly at night. But I think we can all agree that decorations can sometimes feel overwhelming. 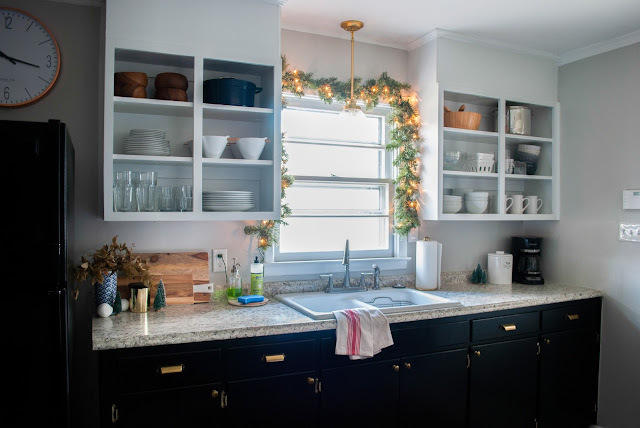 I'm not sure if it is because we're on a tight budget or if I would still decorate this way no matter what, but this year I've tried to focus on using a small amount of decorations that make the biggest impact. That means lit garlands, naked Christmas trees, and a lot of white lights. My favorite holiday find is the lit garland we hung above our kitchen window. I found it while perusing our local mini-mall a.k.a. 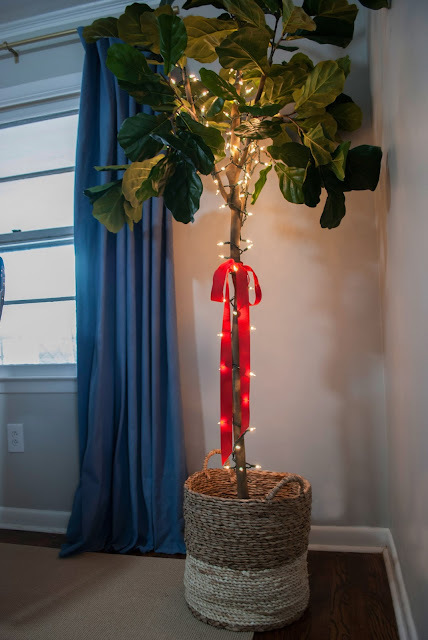 Walmart for string lights. Walmart surprisingly had a good selection of non-cheap looking garlands, among them was this 9' pre-lit beauty for $15 (it's not listed online so check your local store, but here's a similar 9' one ). 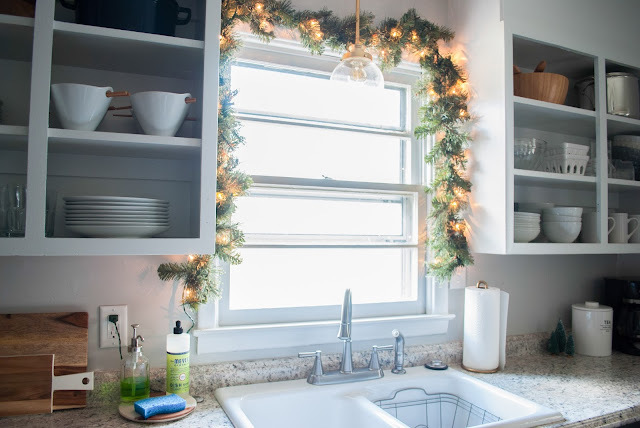 The perfect length to drape over our kitchen sink window which is arguably the cutest window in the house. 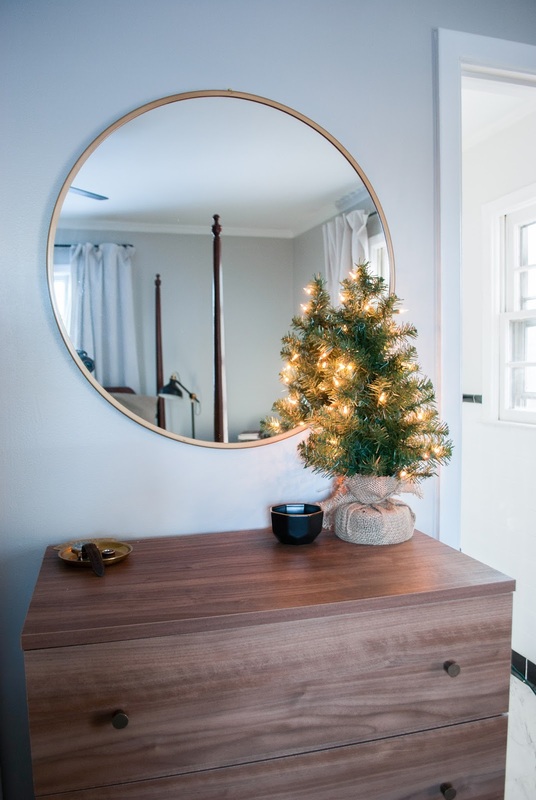 Last year I found this pre-lit mini Christmas tree also at Walmart for just $10 (here's a similar one with a burlap base and one with a wooden base ). While waking the aisles for the garland I saw the same tree for the same price again this year. It is simple but beautiful and more importantly easy to store during the rest of the year. Do you ever have extra clippings you don't know what to do with? 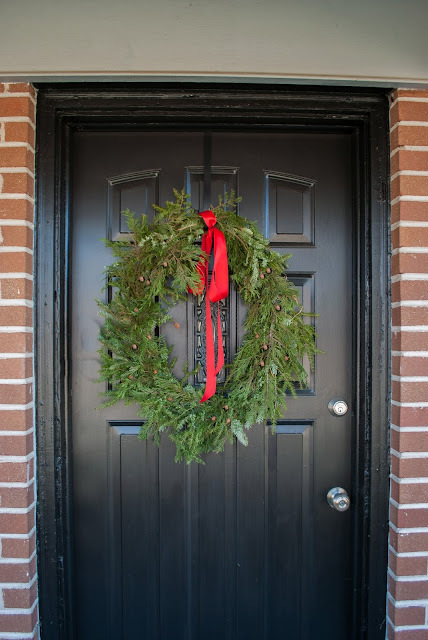 Last week I took the scraps from our Christmas tree trip and made this fresh wreath for our front door. After a few days of coming home to it, I knew it was missing the perfect ribbon. $8 later we put the finishing touches on it with this loose 3" grosgrain red ribbon. For a smaller, more delicate ribbon you could also use this beautiful 1.5" red grosgrain. 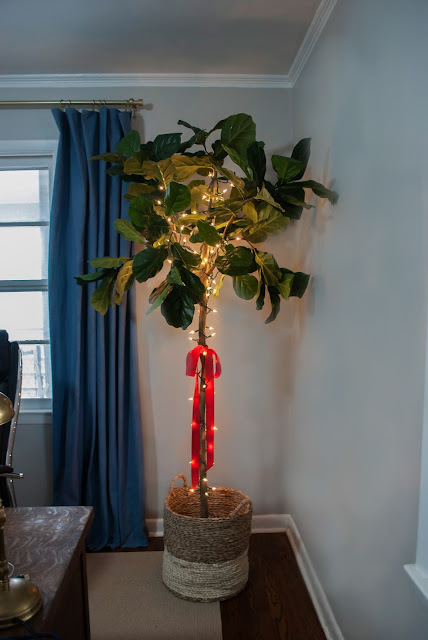 How are you decorating for the holidays? Are you a lover of all things decorations or do you try to keep things simple? 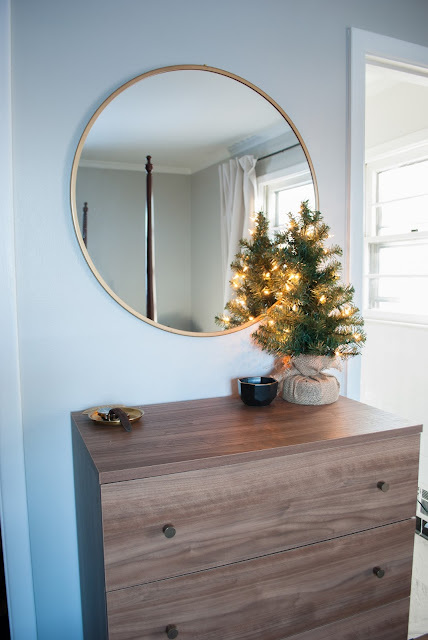 This season is surely turning out to be a crazy one so far, but our home is always more cozy with our small amount of white lights and heated blankets (guilty of never turning it off). Hope you're blaring all the Christmas tunes for the next few weeks!